Hello my lovelies! It has been a crazy, crazy, CRAZY ten days. & share with you all the madness of New York Fashion Week, so now that the week is drawing to an end I will start showing you my adventures from past week over the next few blog posts. So here are a few of the shows I went to on Monday. Unfortunately I didn't love everything I saw, but as with any art, I appreciate it all, it just may not be my taste. So it may not be my cup of tea but I am sure it is to plenty of others. would just say that it wasn't necessarily my taste, just a bit to dark and corky for my me. I loved his presentation layout. Clean but fun, a perfect marriage. I wasn't a huge fan of this collection, mainly because I think that color of green is hideous. but as a whole I thought the collection was just ok.
beautifully but yet they were so structured. It was such a gorgeous pairing of strength & femininity. The collection was full of color! He used alot of pink, yellow & tangerine & paired it with white & black to make the color really POP. I would wear any item from that line. Just beautiful! And he got a standing ovation at the end to prove it. 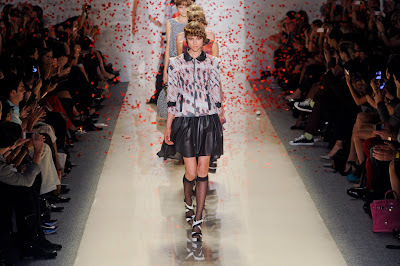 shoes, hair & make-up, to the music & the grand finale of red polka dots falling from the sky. This was hands down the funnest show I went to. 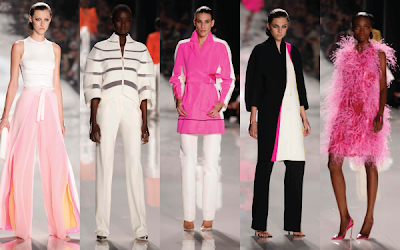 Just based on your lovely photos I'd say my fave is Chado Ralph Rucci- so feminine and lovely! But Emerson looked like a blast too haha!